Playing cards are fun and games for most people, and rightly so. But for a growing number of individuals with a penchant for interesting things, these cards have become a collecting passion. In most instances they’re affordable, and some of them are brilliant in terms of their clever artistry. The Collectors Guide to Playing Cards (Schiffer) by Mark Pickvet, offers an overview of exactly what’s collectible among the thousands of decks or packs if you’re shopping in England, available including values ranging from reasonable to remarkable. “Playing cards have a rich and colorful history and one of the positive factors for collecting them is that they fit all budgets, from inexpensive modern styles to a few select antique examples that reach into the thousands,” shared Pickvet in his book's introduction. The ace of spades is the most important card in any deck. It will usually contain the manufacturer’s name, the place of manufacture and codes that might be helpful in dating the cards. 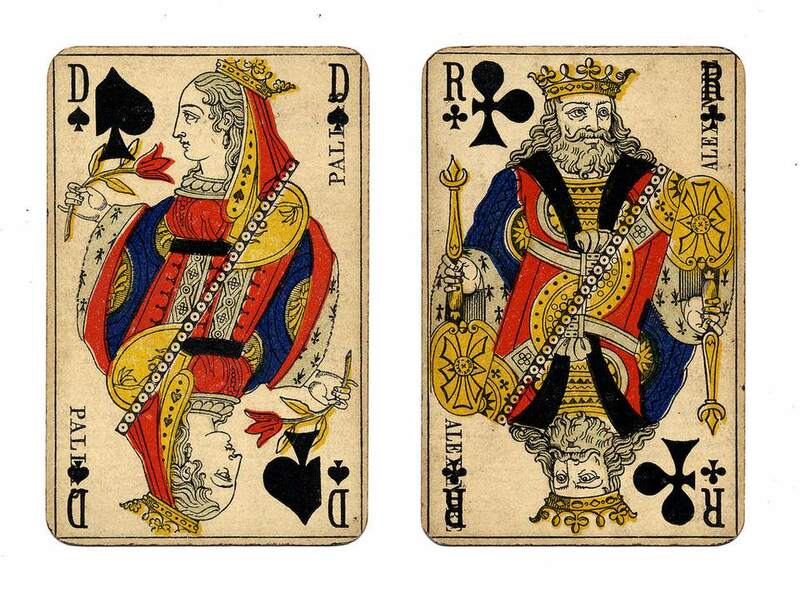 The original cards depicting kings and queens were modeled after true rulers. For instance, the King of Spades was modeled after the biblical figure of King David, and the King of Diamonds was Julius Caesar. Early card decks had illustrations that actually looked like familiar kings and queens, and the oldest versions show the figures with full bodies. Over time, face card illustrations became more cartoon-like or they featured a literary figure like Shakespeare, or a historical figure like Joan of Arc if not another mythological, political, or cultural figure in the place of traditional royalty. Corner indices and jokers are American inventions. Prior to the 1870s, playing cards around the world were made without the numbers or face card letters in the upper and lower corners. Adding the indices is considered to be a major improvement in playing card history. Jokers were also first added to American decks around the same time. Until 1965 playing card decks were subject to “sin” taxes just like alcohol and tobacco products, and they had a revenue stamp on the packaging to prove it. Cards were taxed for the first time in 1892 during the Civil War as a funding measure. Later taxes were imposed due to the association of cards with gambling and mysticism frowned upon by religious institutions. If the original stamps are still present, they can be used to date card decks. Pickvet provides a complete list of the stamp codes with corresponding dates in his book. Older cards were made with coarse paper and unpolished. Some cards even included linen that can be seen by examining the fiber of the paper closely. Plastic coated cards didn’t come about until the 1940s. Only a few types of collectible cards have values in excess of $10-15 per deck. These include decks aged 75 years or more, railroad cards with train illustrations, World’s Fair cards, Coca-Cola advertising, and vintage pin-up girl cards. Most decks commonly found today sell in the $5 and under range including those advertising local automotive shops, insurance agencies, and the like unless the artwork is particularly interesting. Late 1800s transformation cards, those with detailed artwork appearing to animate when the deck is flipped in proper sequence, are some of the most valuable and can sell in the thousands when a deck is complete. Valuable playing cards are not exempt from reproductions. As with most antiques and collectibles reaching a certain price point, playing cards have been remade in old styles. Some decks have copies of tax stamps that are obviously not original making those easier to spot. Pickvet also notes that there aren’t too many true antique decks of cards that weren’t played with, so if they seem too new take a second look. Many “Spotter” cards used by servicemen in World War II to recognize enemy aircraft have been reproduced so it’s best to take a buyer beware stance when purchasing these as well.